Wholesale Custom Personalized Fanny Pack Coolers. Promotional, Inexpensive. Budget Prices in USA and Canada. Hold 3 Cans, Bottle, Cell Phone, Money, Papers, etc. Wholesale personalized fanny pack coolers (waist bag coolers) made of sturdy 600D polyester. Free artwork design. 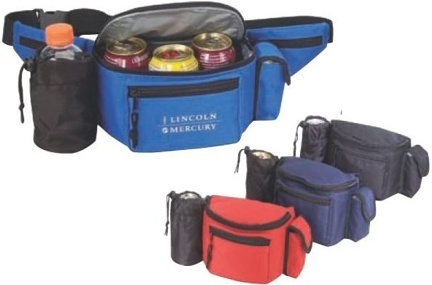 Budget Prices in the USA and Canada for custom fanny pack coolers. American clients pay no taxes. Unit prices below include your 1-color custom imprint. Add $0.35 per fanny pack cooler for each additional imprint color. We also supply blank (not custom imprinted) lunch coolers for $5.60 each (minimum quantity: 24). Setup Charge: $45.00 per imprint color. Additional Imprint Color: add $0.35 per fanny pack cooler. Production: 7-10 days after art approval; contact us for faster delivery. Imprint Size: 4-1/2"x 2" Screen Print.